Last year at kenosha days of discovery Al and I came upon a difficult interaction. I had always intended to post it, and in fact thought I did, buy looking over my posts it is nowhere to be found. Here goes the backstory for todays epihiny. As Al and I were walking along we were called to by an older woman, sitting on a picnic bench. We of course went over and started to talk to her. You could see a look of heavyness, and worry about her, but other than that no distinguishing features except for her eyes. Her eyes spoke of hours of worry, and sorrow, but most of all love. She, fully aware that we were just actors playing a part, needed a favor of the “captain” who stood before her. We, sensing the importance of this moment agreed to listen to her request. The conversation went something like this, “Good Captain, I need a favor” “aye, name it my lady and we shall see what can be done” …yanking of heart strings in 4,3,2,1… “would you take your ship…”, tears began welling up in the corner of her eyes, “and go find my sons ship and bring him home” she went on to explain that he is in the navy and is over in the Iraq area and that she wants him home safe. Here before us was a mother missing her son, really, every mother who has ever had her child go off to war. A mother with no real way of having any influence over her sons situation, and so she turned to us, the fantasy characters who could do what she could not, characters who were not bound by the physical nature of the world. I looked to Al for help, after a slight delay I promised her I would do my best and after a bit of hand kissing we left her company. That moment was the single most difficult interaction I have ever had. I promised her something I knew full well I would never be able to even come close to fulfilling. Life is amazing isn’t it? I do have one regret from yesterday. At this point you may be wondering where the bad was? Later in the day I was passing kids kingdom, with my friends from Port Washington. I heard this forcefull yet cheery, “Hello!” Ian and I looked down to discover my little friend and her enormous smile grinning back up at us. “Come on! Lets go sail on the ship!” While Ian and I had stopped TJ and Gerard, in front of us had continued on unaware of our unexpected stop. I weighed my options. I know from past experience, that if I set foot in Kids Kingdom I’ll be there for at least an hour before I can manage to get myself out. (Ok, Yeah I’m a sucker…) I glanced over at Ian, and he seemed to understand and so I asked her if the ship was ready to sail. “Uhhh yes, absolutely!” “And you swabbed the deck?” Ian confirmed the importance of this task. The girl, not wanting to lose us insisted that it was indeed swabbed. We then tossed out another nautical task, and at this she said she would go check, and ran off to the ship with a “Come on!” trailing behind her. Ian and I looked at each other and then moved to catch up with the rest of our group. We both agreed that under different circumstances we would have stayed and played around some, but we had a limited amount of time and this was probably for the best. Still, I found myself glancing back a few times to see if she was back looking for us. I just hope I didn’t disappoint her to badly. I still feel kinda guilty for dismissing her as she was a really sweet kid. Should I have gone with her? Hey, wait I know you! Towards the end of the day yesterday, T.J. , Ian and I were milling about near the gate. We were finishing up another photo when this woman glances over and shouts, “Hey wait I recognize you!” “Me?” “Absolutly! You were at the Kenosha days last year!” “Aye that I was” “You and your buddy were so much fun!” “Well thankee mam, ya know i have something here I’d like to give you. I then presented her with a message in a bottle. She became quite excited, thanked me and then informed me that she was going to put it in her scrap book. “Awww thankee” “Oh you should see your page!” *BLINK* “My page?” She then proceeded to explain all about the page with the picture she took last year with us and how it’s center on the page with a couple other pictures from the Kenosha Days of Discovery. She continued by telling of how she took pictures of her and her husband and cut their heads out and put them on pirate bodies on the page and decorated the page with other nautical things. She was truly excited to share the description of her creation with me. “It sounds like a right proper work of art it does! I’m truly honored!” At this she instructed her husband to get a picture with the two of us and then afterward, with a hug and kiss, she moved on husband in tow. I’m guessing the buddy had to be Al. So Al and I are in someone’s scrap book. How cool is that? If I ever become desensitized to how truly amazing all of this is, someone slap me please. As I was wandering around with everyone Sunday, I got a chance to actually set foot into a few of the shops. I really haven’t done ANY shopping this year at all. One of the shops we entered was being run by two very fun young ladies. The one was wearing an extremely large fake mustache, and hat. As the three of us got to talking one of the two noticed I was carrying a paddle. She then pointed out this fact to the other, who noticed I had two. I then showed off the “oars” and the puns I have embedded on them. This got a laugh, then they came running out from behind the counter to row and share a bad joke with me. We all laughed, then something really cool happened. One then asked, “Hey did you get the idea from… wait a minute are you the guy “OTB” talked about on his end of the year wrap up last year? ” I blushed… “Uh… Guilty as charged” “OH MY GOD!!! THIS IS SO COOL!!! WE HAVE THE ROWING GUY IN OUR SHOP!! !” I presented them with their own messages in a bottle, and they were ecstatic, and proceeded to read them in pirate voices to each other. As I left they begged me to come back next weekend and row for them. So I’m some sort of a celebrity? Wow, thanks OTB! Who knew? As I was rowing along Sunday after parade I came across a little boy in his stroller. He saw me, his eyes met mine, and he drew his foam sword and began to wave it at me. I then countered with my oar, and we battled it out. His excitement got the best of him and he started talking to me. He was a fairly young kid and so the conversation was pretty random initially, but then he stated. “I’m Peter”. “Well then peter, its a pleasure to meet ya” “No, I’m Peter PAN!! !” <GASP> “Peter pan! Oh dear”, looking around nervously, “I’ve heard all about you!”, at this the little boy started that I was Captain hook, and he was going to get me! “Oh, but you see Pan, I can’t be hook, I still have both hands!” Not to be thwarted by that, “Ok, then you are Mr Smee!” “Well so Smee it is then, I like being Mr Smee” at that he grinned and waved his sword again, and we clashed a little more before his mother told him he needed to let the pirate go on about his business. She smiled at me, and thanked me. I thanked ‘Peter’, gave him a message in a bottle, and off they went. They headed towards the fairy glen, and I really wish I had thought to tell him to keep his eye out for Tinkerbell in there. 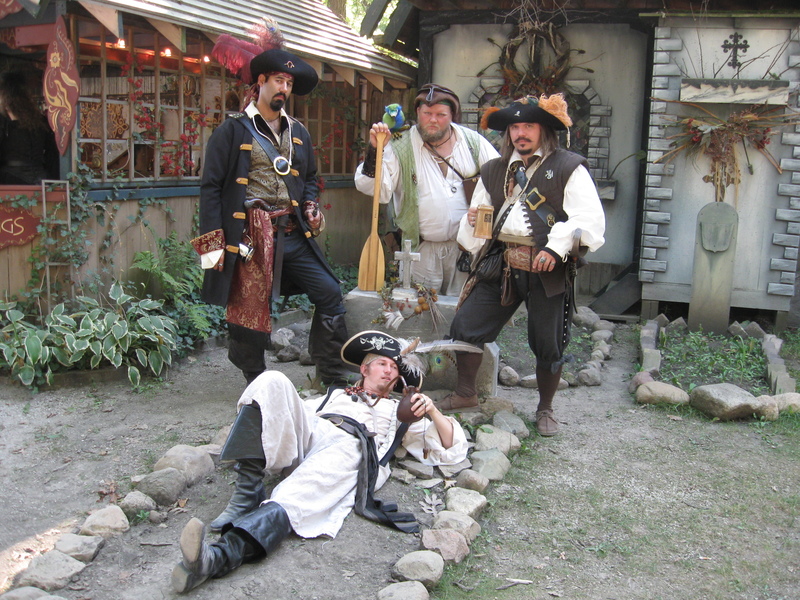 This Sunday around 2 pm I was able to meet up with some of my friends I have made through the Port Washington Pirate Festival, Ian, T.J., and Bilgemunky. It’s been far to long since we last had a chance to wander about and cause trouble. It was actually T.J.’s first time at Bristol and he debuted his new character, “Captain Joseph “Bloodbath” Copper”, which seems to be a hit. The four of us spent most of the rest of the day wandering around together, with me disappearing for about an hour or so to go sing in FOF. One thing that struck me, as well as the others, was how much we were photographed. I get quite a few pictures taken of me on any given weekend ( it’s the oars), but these five hours were quite impressive. It seemed like every time we moved more than ten feet there was an onslaught of requests for pictures. I also noticed a large amount of “drive-bys” of people too shy to ask us to stop, but snapping away anyway. At times it made it hard to have any conversations of our own, but to me, it was worth it. Sundays may technically be my day off, but as big as the crowd was this Sunday it seemed to me that Bristol needed everyone it could get. Besides, I have a lot of fun playing with people and I’m not about to reign it in when there are people actually wanting to play. I did notice that the, more flirty, slightly less kid friendly Hawser came out to play more often. It’s much easier for that to happen in a whole group of pirates than it is for me to do so, one on one. Although, honestly, it was simple enough to dial it back again around the kids that approached. Again, I just can’t say how much fun it was hanging out with the “crew” again, and just wandering.